The first time I clicked on a dog in Pillars of Eternity II, I was delighted. He went right into my inventory. Then I equipped him to my character, and he followed me around, wagging his tail and boosting my stats. What a good boy! So I clicked him again to give him the pets he so richly deserved. Nothing happened. I was crushed. After all the strides in furry friend floofing made by recent games like Far Cry 5, it was disappointing to return to a cold, sterile world where it felt like my animals were forever stuck on the other side of a pet shop window. On a whim, I decided to ask developer Obsidian if petting animals was something that had been ever been on the table. “As much as I would like to spin a yarn about a pet petting feature that got cut, we did not,” game director Josh Sawyer replied in an email. The team didn’t even try to let me pet pets! This struck me when I first found out, but I wasn’t sure exactly why. I mean, much as I like to joke about it, petting animals in games isn’t actually that big of a deal. At best, it tends to be a fun little wink at the player—one that’s likely not worth the additional animation costs and labor for many studios. I’ve always been a stickler about small, inconsequential interactions in games. If there’s a basketball hoop and a basketball laying around, I expect to be able to at least try to shoot a basket (even if it takes me hundreds of tries before I finally make one, Overwatch’s Jeff Kaplan). If I smack a flower vase with all my might, I expect it to at least fall, if not shatter. If a game has a toilet, I expect to be able to flush it. The obvious reason these things would matter to anyone would seem to be a simple case of “realism,” but I think it’s more than that. In the above three examples, my sense of realism would come from being able to interact with things in the game world, from having even more power and control than I originally thought. It’s agency that’s ultimately inconsequential, but it still feeds into the fantasy that I can do anything, and that I’m smart and cool for trying. Petting animals, though, is different. Yeah, having pets that run around and do your bidding still falls squarely in the power fantasy realm, but it’s also the rare case in which a video game character reaches out and touches something not to kill or control, but just to be like, “Hey pal, I hope this makes you feel good.” That both humanizes the character and adds an extra dimension to the pet. 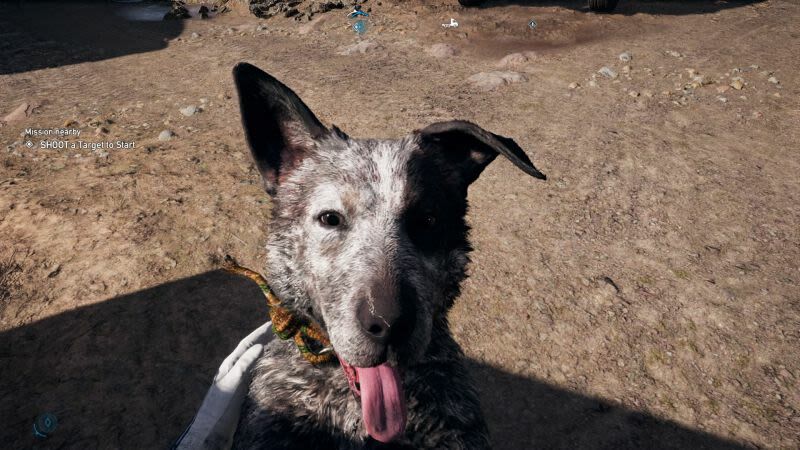 After almost every big battle in Far Cry 5, I’d make sure to turn around and interact with my dog. Just like that, he’d go from crouched and on-edge to a prancing picture of canine glee. Doing that legitimately never got old, even after hundreds of random fights against nameless goons. Contrast that with Pillars of Eternity II, where the dogs, cats, and even pigs are well-animated but ultimately distant, feeling more like quadrupedal tools than loyal companions. Most of the time, I forget they’re even there. For nearly 20 hours, I had a particular dog following me around, but I had no trouble swapping him out when I found a cat that gave me a better stat boost. My pets could be floating fairy creatures or even just hats for my pre-existing characters to wear. It wouldn’t matter. My character in POE II, meanwhile, rarely feels like a physical entity except when she’s fighting. She can walk and talk, but she doesn’t do much to actually inhabit the game’s impressively lively, flavorful world. Compare this to Divinity: Original Sin 2's moments of touch between party members and other miscellaneous characters. No, there weren’t animations for these contextual moments, but even little dialogue box interactions that let me hug friends who are dealing with serious trauma or try to pet undead kitties who were horrified by their own bony bodies added a lot. I felt like my character was physically there, and she wasn’t just looking to bust skulls. She was doing whatever she could to help others, even if sometimes that just meant a supportive hand on a shoulder. Or a dog snout, as it were. Also, Divinity: Original Sin 2 let me talk to every dog. Every dog. All of which is to say, a little touch goes a long way. I don’t expect every game to turn me into a dog whisperer, but let me at least pet the puppies, damn it. You’re reading Steamed, Kotaku’s page dedicated to all things in and around Valve’s wildly popular PC gaming service.